The Mezlan shoe collection is finally here. After numerous customer requests, MensDesignerShoe.com is proud to now offer the entire Mezlan shoe and boots collection. Mezlan has been producing the finest in Spanish made footwear for many years, and has become a household name among male shoe enthusiasts, for their use of beautiful leathers including exotics, their high quality, and the way they offer modern styling that is fresh every season. Mezlan has become a go to brand for many of the entertainment elite, and it is no surprise. They differentiate themselves from other men’s luxury shoe brands in the marketplace, in the way they offer unique and trend setting styles and colors, while also offering a core group of traditional styles for those that are going for a more subtle look. 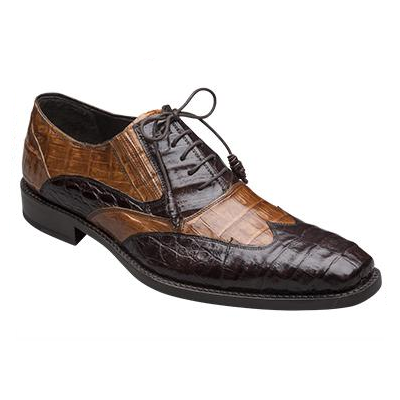 Whether it’s an eye catching two tone crocodile wing tip shoe like the Dade, or a traditional calfskin fringe loafer such as the Santander, you are sure to be wearing a quality shoe when you wear Mezlan. Recently Mezlan has taken their Spanish designs to Mexico to produce a range of less expensive styles, with genuine crocodile loafers in the $500-$600 range, and beautiful deerskin lace ups and loafers in the $200-$250 range. Of course they have and always will be most known for their Spanish made collection, including their Custom styles that are available in limited quantities every season. Shop Mezlan shoes, and boots and wear the finest in Spanish footwear.